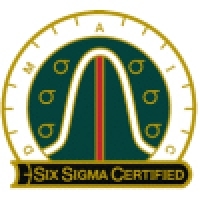 A pin to signify your Six Sigma training achievement. High quality Cloisonné jewelry in gold finish with clutch back. Attractive suede pouch for storage. If you need a replacement certificate and more than than 60 days have passed since your class ended, you can order a high resolution, printable PDF file here. We will create and email your replacement PDF certificate upon processing your payment. Acclaro DFSS Software with 1 year maintenance agreement. Showcase your certification in style and order a color certificate printed on parchment paper suitable for framing.